Here's another giveaway with a trio of winners.This time, we're open to continental US residents only. This one ends on 6/5 so could make a great Father's Day present. Good luck. 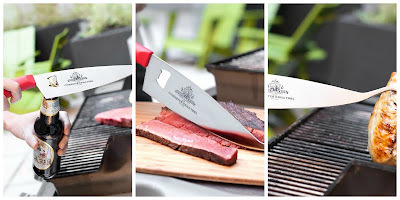 Holiday Contest and Sweeps along with a amazing group of fellow blogs worked with Ergo Chef Cutlery to bring you "Ergo Chef Summer BBQ Spectacular Giveaway". Three Lucky winners will win a prize package that anyone would be delighted to win. Nobody else come close to the quality and craftsmanship that Ergo Chef puts in every single product that make. 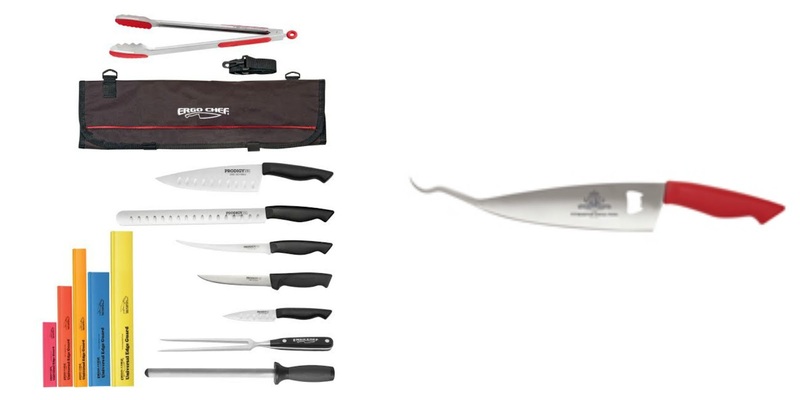 This Kit includes razor sharp Prodigy Series high carbon stainless steel knives. We provide our 10" Pro-Series Diamond Coated oval sharpener to keep them performing like new. 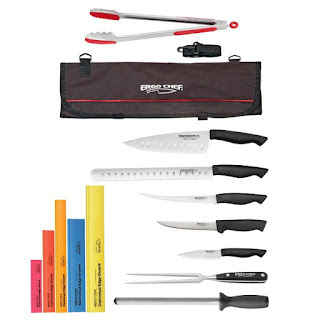 An edge guard is included for each knife in different colors for safety and edge protection. The 8" Pro-Series carving fork is one solid piece of carbon stainless steel for lifting a whole brisket or pork shoulder and serving it up with ease. The 15" Red DUO Tongs lift upto 20 lbs. of food and have a 500 degree silicone side for pan use and stirring up sauce & a steel tooth side for getting a good grip on all foods you cook on the grill. The 9 pocket soft roll bag holds the tools safe and easily for storing and carrying with a shoulder strap for the competition griller and BBQ guru. Handle Material: Non-slip ergonomic grip TPR 95 Durometer - Hard yet grippy for precise control. 9 Pocket Roll Bag: 8 elastic pockets for holding knives & a mesh pocket for holding smaller gadgets, Thermometers, etc. The Myron Mixon Pitmaster Grill Tool is the first tool to deliver a style and functionality that says “Game On”! Coming from the world's winningest man in BBQ he knows what works. The 3 in one design was specifically developed & tested for easily flipping all your proteins & large veggies on the grill with the patented flipper hook. A good sharp knife is a must to slice up your mouth watering Q, hence we use the “Workhorse” an 8” Chef knife size blade with 7" cut for slicing up your meats and veggies, from prep to serving. 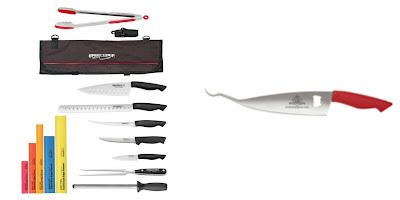 The blade is high carbon stainless steel for superior durability, ground precision sharp for perfect slices. It boasts an ergonomic non-slip grip handle over a full-steel tang for strength and balance, so cutting is effortless with ultimate control. Last but not least is the bottle opener, built into the blade to keep you cool, sipping your beverage of choice. Now get grilling your favorite foods, and be the boss of your grilling domain with the ultimate “Myron Mixon Pitmaster Grill Tool”. Did you Know that Myron Mixon has won more BBQ competitions than any man alive, so he knows what works! This tool is no exception! We grill a all the time. We would love to win this.